Do you feel relatively calm before your dental appointment or are you a little nervous about a visit to the dental office? Do you worry about it days or weeks before the appointment? Are you someone who is actually terrified about dental treatment and worries about it all the time? Do even those things that are supposed to make visits more comfortable just seem to increase the apprehension or feeling of anxiety and being out of control — like anti-anxiety medication, nitrous oxide (laughing gas) or local anesthesia — numbing the treatment area (injections, needles, shots)? Whichever end of this spectrum you might be on, it may be helpful to know that you are not alone. Actually, having a little or even a lot of nervousness about dental visits is common. Some studies have concluded that up to 75% of people surveyed have at least a little fear about dental visits. In addition it appears that 10%-15% of people have a great deal of fear — so much so, that it prevents them from having any dental treatment at all. There are people who have frequent dreams about dental treatment; some will only eat soft foods because they are afraid that they might chip a tooth and then need dental treatment. As a consequence these individuals who put off having dental treatment suffer for years with toothaches, infections and poor appearance. It's possible, even for those people who are the most fearful, to reduce their fear and to learn to have dental treatment in a way that feels calm and safe. 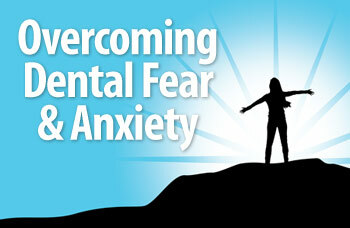 While dental fear can result in stress and avoidance of care, it can also have more wide-reaching consequences. For some it affects their whole identity and sense of self worth. They may see other people who don't seem to have the same reactions to dental treatment and begin to feel that something is wrong with them. “Why can't I do this thing that other people seem to do so easily?” In fact, untreated oral conditions may result in even worse general health complications. In the end, it's in everyone's interest to find ways to overcome dental fear and make dental treatment a calm and safe experience. Now for the good news! First, it's helpful for many people who are fearful to know that they are not alone. It's also important to realize that help is available. Actually, experience has shown that even people who have extreme fear about dental procedures can get over their fears and learn to have dental treatment in a manner that feels calm and safe. If you have been afraid for a long time you may have difficulty believing this, but even people with long standing fear can be helped. Before we describe how it's possible to get over dental fear, let's first review some things about what makes people fearful. How do people become afraid of dental visits? No one is born being afraid of dental visits. So everyone who is afraid has learned somewhere that dental treatment is something to fear. Some people learn this because they've had previous bad dental experiences. The sense of loss of control in the dental environment may be enough to avoid dental treatment forever. And still others may be afraid due to stories they have heard, movies they saw or other indirect experiences. The message conveyed to a child from a scared parent might be that going to see a dentist is something to be afraid of. Such messages may cause individuals to avoid treatment and not have any opportunity to learn that things can be different. Fear and anxiety can also be reinforced inadvertently. Think about it this way; try to remember a time when you were really afraid of something, do you remember how your body felt? Was your heart beating quickly, palms sweaty, stomach in a knot? Those and other symptoms of being afraid are all unpleasant feelings. So, if someone who is already afraid forces themselves to go have dental treatment and re-experiences those same bad feelings during the appointment, then what they will remember afterward is those same unpleasant feelings. It doesn't matter how friendly the dentist is or how pain free and pleasant the treatment is. What you remember is the feeling of being afraid, thus reinforcing the idea that there is something to be afraid of. In fact, dental fear begins at the subconscious level. People have what we call an “automatic fear response.” Jane says “I feel like something just takes over and I begin to sweat and my stomach tightens up. I don't really have any control over it.” Since this automatic fear response is subconscious, you can't make it go away using logic or reason. Telling Jane that “there is nothing to be afraid of” won't help. In fact it might make things worse because it could sound like you are saying there is something wrong with her. So, how do we change this pattern of fear and reinforcement? Let's find out. As we said earlier, it's possible, even for those people who are the most fearful, to reduce their fear and to learn to have dental treatment in a way that feels calm and safe. The basic idea is really very simple. In order to counteract past bad experiences you need to have new positive experiences which lead to the development of improved feelings and attitudes. The more bad experiences you have had or the longer they have gone on, the more good experiences you need before you will have different reactions to the same situation. Dental health professionals know that your mouth is a very personal place and trust is a big part of allowing us to partner in your care.